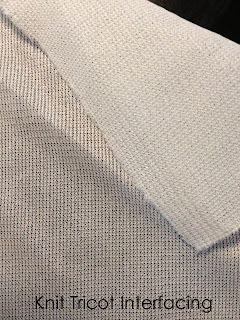 Interfacing is so important when making a garment. It helps stabilize fabric, stiffen it where needed and all around help make a better garment. But choosing the right interfacing can be confusing if you don't understand the different types. I will be highlighting the most common interfacing, including my personal commentary. 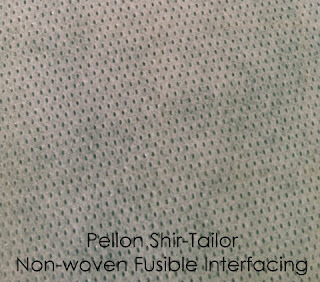 Fusible woven interfacing is basically a thin piece of cotton-like material with fusible on it. Fusible non-woven interfacing is a bonded material (usually polyester) with fusible on it. Both can be used in the same way. Use it for collars, cuffs, waistbands and some necklines. These can also be used to stabilize areas like buttonholes. 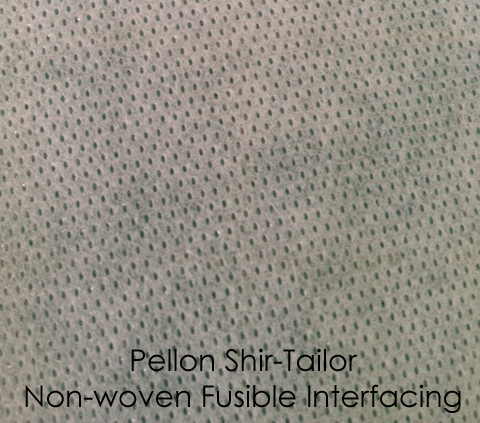 I really like to use Pellon Shir-Tailor for buttondown shirts. Use it on the cuffs and the collar. A rule of thumb would be to use a lightweight interfacing with a lightweight fabric and a medium or heavy weight interfacing with the same weight fabric. Do not use fusible interfacing on laces or netting, beaded, sequined fabrics, vinyl, leather, rainwear fabrics, acetate and faux furs. If you need to stabilize any of these fabrics (except the laces) use non-fusible interfacing. Use a press cloth to adhere to some fabrics in case the fabric cannot stand the temperature at which you are using. I sometimes use a damp press cloth. When using a damp cloth, it "tells" you when it is adhered--- the fabric drys and your interfacing is fused in place! Yes you can use interfacing on knits! You will want to find a lightweight knit tricot interfacing. It is essentially a sheer knit with glue on the back. You can also find knit tricot interfacing without glue. This will help add shape to cuffs, necklines, etc. Many patterns call for a strip of fusible interfacing along shoulder seams also. When making a handbag or tote, adding interfacing helps make it not "homemade." I had a stint in making purses and the right interfacing was key. I used buckram, a heavy canvas-like material to get a good stiff look. If I wanted to make the purse soft with some stiffness, I used fleece and a light-medium weight fusible together. I fused the interfacing to the fabric. - Use Silk Organza to stabilize anything that is as stiff or stiffer than the organza itself. It should also be used anywhere you need extra stiffness. Pre-wash the silk organza if you use it in a garment that you will be washing. No surprise shrinkage! (Do not substitute poly or nylon organza for the silk. According to Threads Magazine, "The crispness of silk organza is due to the natural gum left on fibers during processing; in man-made polyester, the stiffness is engineered." I just made a few button-down shirts for my husband and actually used two different interfacings on the project. I used the Pellon Shir-Tailor interfacing for the collar and cuffs. Then I used woven fusible interfacing for the button area. The Shir-Tailor can be a bit stiff for that area (personally), so I used something just a little bit lighter. I hope this helps you figure out what you need for your next project and make it a success! We carry some interfacings on our website. Check it out now! Thanks so much for this!! I feel interfacing really makes a project stand out, and not look homemade, so this really helps me get a more professional look! Thank you. My project entails fusing re-purposed denim fabric and the tutorial indicated "use a woven fusible interfacing". I am concerned that if I don't find "woven" it will mean all my work would be in vain? Help! Resource Library: Choosing the Right Needle. Sew Along - Winter Coat Finished!! Julie's Picks Sewing Contest Announcement! Guest Post: Sarah from Lou Bee Clothing! At Fabric Mart: Our New Year's Resolutions!